Tamil Nadu 12th Result 2019: TN HSC Result 2019 has been officially declared by the Tamil Nadu Board. Students can rejoice as they no longer have to wait for the Tamil Nadu 12th Result 2019. The Board has released the TN HSC Result 2019 on its official website - tnresults.nic.in. Candidates can now visit the official website and enter their requisite details such as roll number and hall ticket to download the Tamil Nadu 12th Result 2019. As per the reports, over 9 lakh students have appeared for the TN HSC exams that was held from March 1 to March 19, 2019. The Tamil Nadu Board has declared the TN HSC Result 2019 for all the streams including Science, Commerce and Arts. The Tamil Nadu 12th Result 2019 has been declared online only, no other mode has been used to declare the TN HSC Result 2019. For latest news and updates on the Tamil Nadu 12th Result 2019, candidates can bookmark this page and visit the same regularly. The important dates of Tamil Nadu 12th Result 2019 are crucial for students who are looking forward to their TN 12th Result 2019. Prior knowledge about TN HSC result 2019 important for the students to stay updated on all the latest developments concerning the declaration of the results. How to Check TN PUC Results 2019? Post the TN Board 12th Result 2019 is formally announced by the board, the students can visit the official result page of Tamil Nadu State Board of Secondary Education (TNBSE) - tnresults.nic.in and enter their respective roll numbers in the space provides and click 'submit' to get their results. We will also provide a direct link to check the results at the top of this page, as soon as the result is declared by the TNBSE. Before the Tamil Nadu board exams are conducted it is beneficial for students to go through the previous year result statistics to calm their nerves. Now that students are only days away from their Tamil Nadu Board 12th exam 2019, it will be helpful if they go through the previous year statistics to get an idea of some key aspects of the exam. According to media reports, last year 94.29 per cent students passed in Science stream, 87.45 per cent students passed in Commerce stream, 79.65 per cent students passed in Arts stream and 80.18 per cent students cleared the Vocational stream. 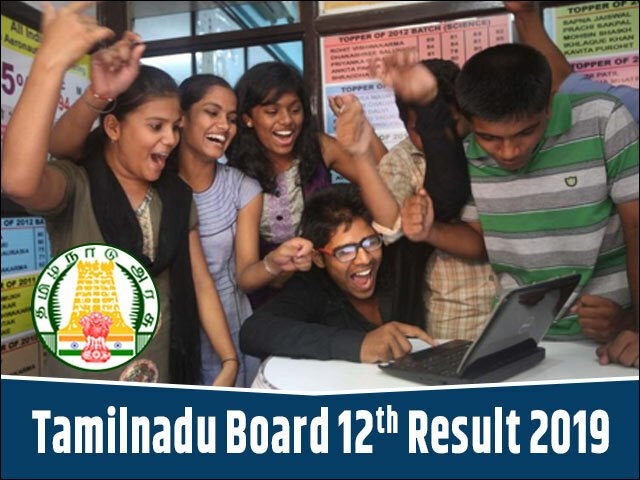 What after Tamil Nadu Board 12th Result 2019? The moment the TN 12th Result 2019 is declared, students will be in a state of frenzy checking and evaluating the outcome. Students will have thousands of doubts and questions in their mind in regards to their Tamil Nadu Board 12th Result 2019. Students must calm themselves and think clearly. The most important thing to do after the announcement of the TN Board Results 2019 is to check the result and download the same. Students can print out their TN PUC Results 2019 for reference purpose. However, they must be informed that the print copy of the result is not an original document and colleges will need official mark sheets for final admission offer. Students can use the printed copy of the Tamil Nadu Board 12th Result 2019 for admission purpose but on provisional basis. Every year over 9 lakh students sit for the Tamil Nadu Board 12th exams, of which not all are content with their performance, some even struggle to clear the board exams. There may be instances where a student may feel s/he had done better than the scores obtained, in such case the student may seek for re-checking/ re-evaluation process that is offered by the TN Board. The re-evaluation and re-checking are important aspects with regard to the Tamil Nadu Board 12th Result 2019 that a student must keep in their mind. In case the students do not feel that their efforts have been truly justified in the scorecard, they can apply for re-checking / re-evaluation of the answer sheets. In case there is any change in the final mark tally, the same would be updated in the original mark sheet. In cases, where a student who unfortunately fails in the exams, s/he will be provided with another opportunity to prove himself/herself. The student will be able to appear for the compartmental/ supplementary exam. The supplementary examination may be scheduled to take place in the month of June. The same will be notified here in this article and also by the board on their official website. Students are advised to bookmark this page for any update on the TN Board Results 2019; they can also fill in their details on the link shared in this article to receive notification in regards to the TN HSC Results 2019. The Tamil Nadu Education Department was established about 100 years ago to conduct examination for the HSC and the SSC during the British era. Later, after Independence, it was formed in 1978 as a separate department to monitor and regulate secondary school education in the state and to conduct yearly examinations to evaluate the academic performance of students through Tamil Nadu 12th Board Examination and Tamil Nadu 10th Board Examination. Tamil Nadu Class 12 Result 2019 has been declared by DHSE, Tamil Nadu at tnresults.nic.in. Check the best career options available to class 12th students. TN HSC Result 2019 for Class 12 Result has been declared on tnresults.nic.in. Check the important dates that students must keep in mind after declaration of TN HSC Result 2019.